My hand painted leather & coin Super-Thimble is comfortable, durable, and fitted specifically for my finger. Flight attendant and fashion hats made of buckram, fosshape, fabric, and straw braid. The White Witch's crown is made of wire, thermoplastic, and beads. Aslan's crown is hand sculpted out of fosshape. The White Witch's Bad Creatures are made of foam and fabric shapes built on top of athletic safety gear and custom-fit helmet bases. The modular sculptural pieces allow the base garments (spandex suits and knitwear) to be laundered regularly. Photo by Elise Bakketun. The Giant Rumblebuffin's stilt boots in progress. The removable foam boots are attached to the bottom of drywall stilts, with cutouts in the soles for safe stilt contact with the floor. Bad Creature Pig, Bull, and Hunchback heads, in progress. Made of lightweight foam built up from custom-fitted fosshape helmet bases. Custom designed for a wedding, handmade of paper, wire, and beads. Custom designed and handmade for a bride. Paper, wire, beads, found objects. Photo by Kruger Images. Custom designed and handmade of paper, wire, and beads, for a summer picnic wedding. Tree headdress for a seasonal window display at Butch Blum Seattle, representing Seattle Children's Theatre. Made of fosshape, faux flowers, and fabric/foam tangerines. Hand painted to match the existing costume. Aviator style faux-suede hat with goggles for the Delivery Dog. My hand-embroidered emblem for vegetarian piracy. Hand painted Jaguar suit with fur headdress. Custom made out of felt. I worked as assistant to Annett Mateo, puppet master. We made muppet-style puppet versions of all of the casters at the event. 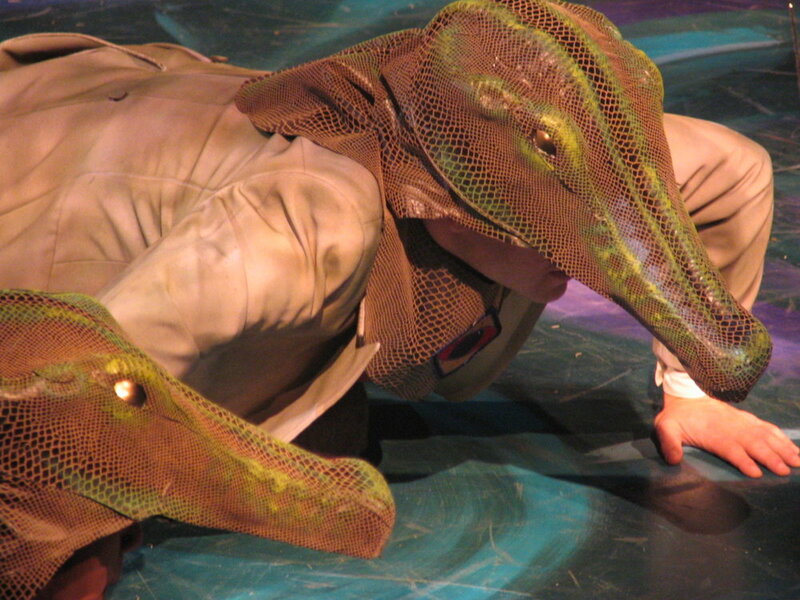 The puppets are made of reticulated foam, fleece, and various structural materials in the hands and mouths. We altered and created clothing and accessories to fit the puppets. Puppet hands and arms in progress. Pullman train porter and conductor hats, recreated based on research photos. Mother Ginger's skirt hides 8 child dancers underneath, who exit and enter through the drawstring curtain "door" in the front. The skirt is approximately 10 feet wide, has 175 snap closures, and required 115 yards of blue hand-pleated trim. Photo by Angela Sterling. Flower tiaras made from wire, metallic trim, synthetic crinoline, and Swarovski crystals. Some process shots of building the Mother Ginger skirt. Team Mama G spent many weeks constructing the 10+ foot wide skirt over a two-part aluminum apparatus. The skirt floats freely above the ground via an adjustable custom harness on a stilt-wearing performer's waist and shoulders, weighs 60 pounds, and conceals 8 child dancers underneath. The entire thing is engineered to disassemble into several pieces for maintenance and storage. Snow tiaras in progress. They are made from buckram, fabric, wire, crystal beads, and hotfix Swarovski crystals. Arabian peacock skirt details: embroidered fabric eyes with tubular horsehair and sew-on crystals. The Dish's hat is made of fosshape and painted to match the designer's own china set. Hand dipped silk scarves, ties, and pocket squares for 104 symphony musicians, in ombre acid dye. Designed by Michael Cepress. Hand dyed silk scarves, ties, and pocket squares for 104 symphony musicians, in three colors of blue-green ombre. Designed by Michael Cepress. The Angel's wings in progress. Sprung steel wire and fosshape, before paint and fabric. 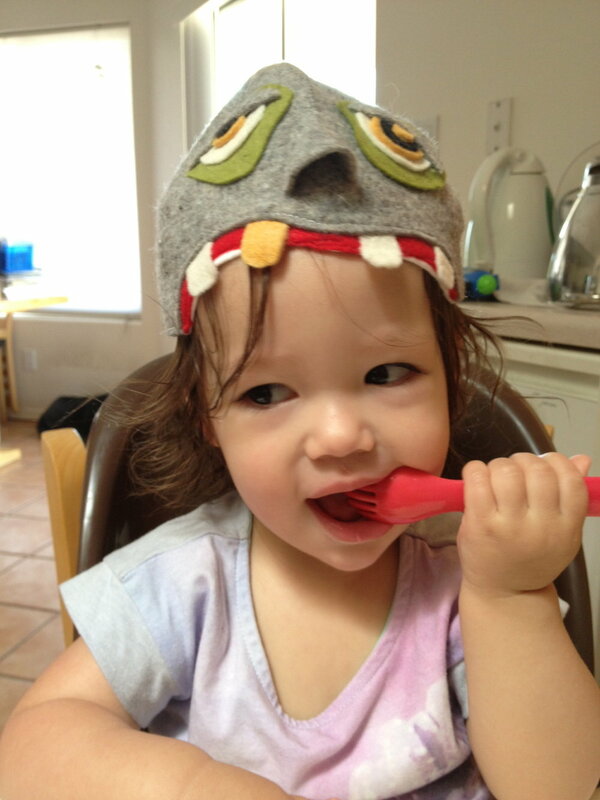 The wings are lightweight and have gentle, natural movement. 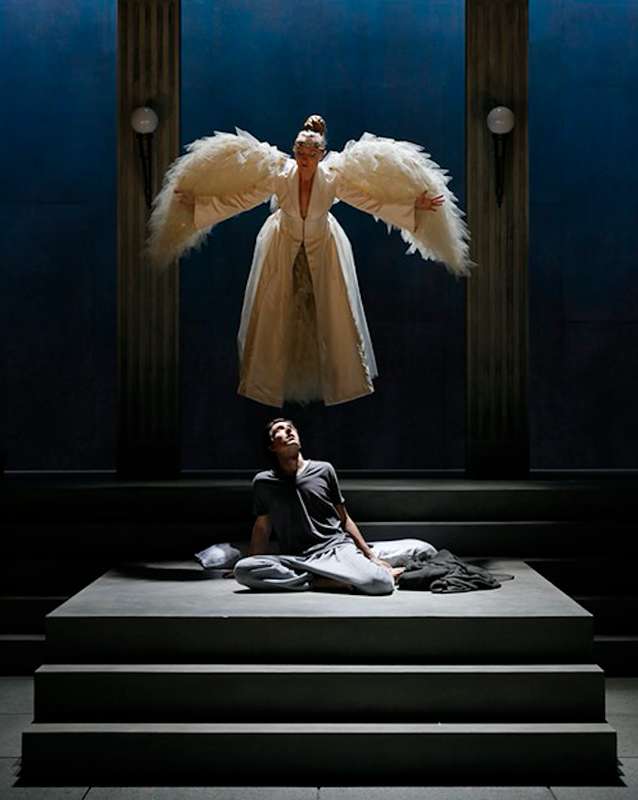 The Angel's wings coordinate with her dress and with a flying harness. Photo by Chris Bennion. Bo-Nita's prosthetic burn scar armpiece is made of body-safe silicone. This donkey mask for "Bottom" has puppet ears on wires that run down to the waist, which can be controlled by the actor for more expression. It's made of thermoplastic and faux fur. The inside is padded with foam and flannel for comfort and fit. Bottom's donkey head mask. Photo by Casey A. Cass, University of Colorado Photo Department. Table dresses on casters for hors d'oeuvre servers. Cavalier hats, leather sword rigging, and boot top modifications. Six dancing duckling eggs that hatch on stage. Six dancing duckling eggs that hatch onstage. The eggs are made of foam and have some visibility out of the spots. 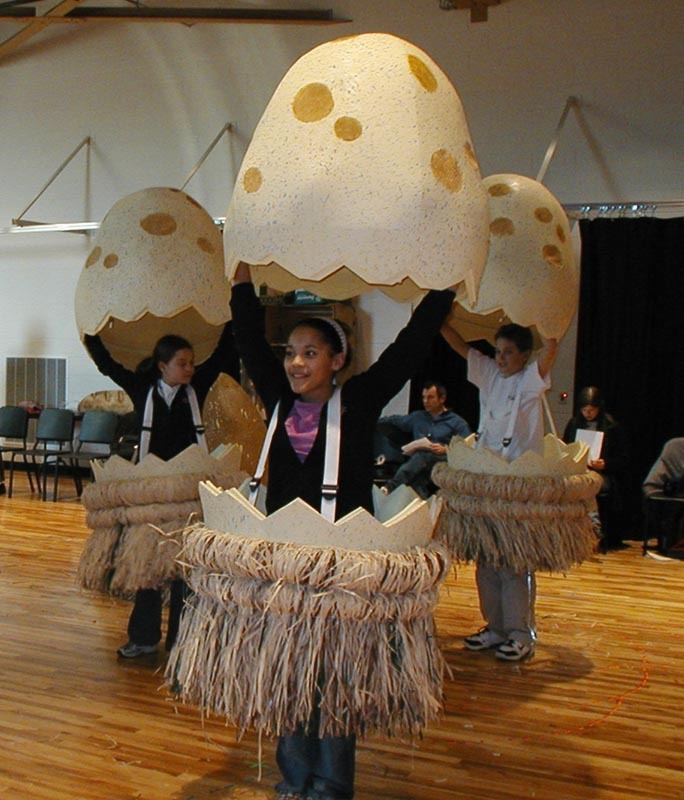 Dancing Duckling Eggs that hatch on stage. The soft foam eggs are built in two parts which can be fitted back together with a tongue-and-groove system with snap-tabs that release prior to breaking. The top part of the egg has handles, and the bottom part has a suspenders-harness to keep the egg on the body. Bird Girl showgirl headdresses. Ostrich feathers, wire, and beaded trim on buckram bases. This Zombie Celery Stalk costume fit a 6 foot tall actor. It was able to bend in the middle for entrance and exit through refrigerator doors on set. Masks made of fosshape and paper-mache. Mask in progress. Paper-mache over fosshape. 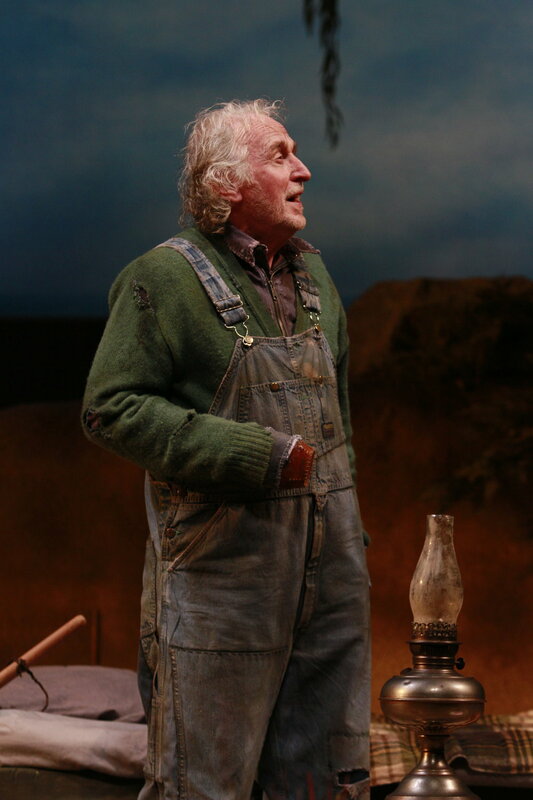 Caliban's costume was created from a layered collage of materials including fabrics, landscape erosion cloth, and painted scales made of milk jug plastic. Custom lino cut block printed fabric for collar and cuffs, based on period research. Four varied Hell Hound masks. The battery-powered lights in the eyes are shielded from the actor's own eyes, and the insides of the masks are padded for comfort. The Cat's iconic hat and tie were created with fosshape and fabric. Collar pieces made of felt. Designed by Michael Cepress. Dancer skirts made of coat hangers and plastic grocery bags. Sylvia the dog's cone collar is shaped specifically to fit a human head and neck while allowing visibility of face from the audience, and padded for the performer's comfort at the neckline. Distressing treatment on a coat. Centaur in progress. The Centaur was made by sawing a fiberglass display pony statue in half, and building a secure waist harness with back padding onto the front end. The back legs were lifted for congruity with the actor's height, casters were added, and new shiny gold hooves were rebuilt over the casters. The tail matches the mane on the helmet. Centaur's helmet. The mane is made of sheer fabric edged with plastic filament for an airy, bouncy movement, with faux fur trim at the base, added to a mass-market plastic costume gladiator helmet. Made of leather and felt scraps. Cow, Chicken, and Duck masks were sculpted in plasticine, cast into a negative plaster mould, and finally cast in liquid latex. Hoods and shoes for disgruntled teenage department store elves. The shoes are a custom ankle boot added on top of canvas sneakers. Showgirl headdresses for Helen and Annie in the finale. Made of glitz fabric and ostrich feathers on a buckram base. Airbrushed and hand-painted leopard-pattern spandex drag queen catsuit. Photo by Chris Bennion. Fish heads with lips. Rubber bathing caps with fins made of liquid latex and plastic rods. Alligator headpieces with battery-powered light-up eyes. Faux lizard-skin and paint over thermoplastic base. I dyed approximately 100 yards of linen the same color, which the entire show's costumes were cut from. Batch dyed with custom-mixed fiber reactive procion dyes. Bottom's donkey headdress is built on a shoulder harness with thermoplastic mask (nose) piece and an openwork collage of natural and natural-looking materials. Bottom's donkey headdress being removed on stage. Snout's "Wall" shoulder piece is made of fiberglass and foam. Period shoe modifications to standard dance character shoes. Hand felted mouse-eared hats for the entire cast. Wet felting process for mouse-eared hats made of merino wool roving. 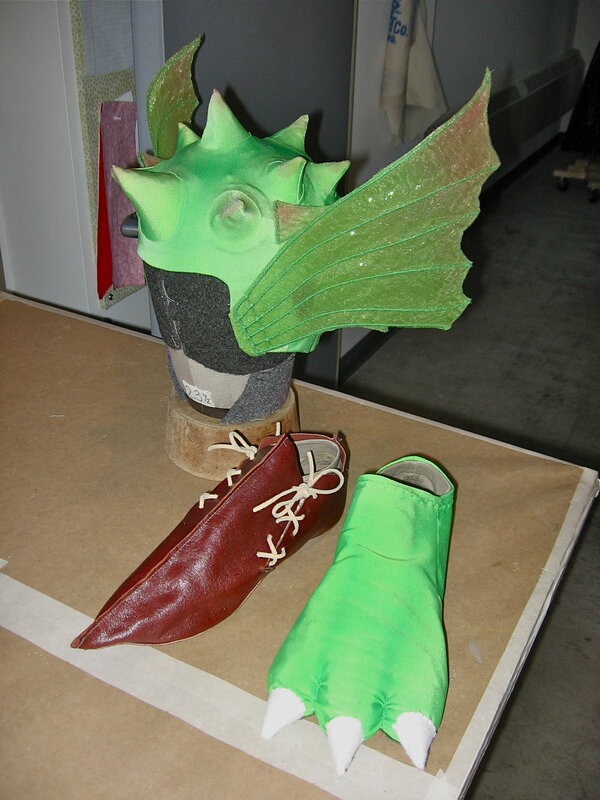 Dragon-man's headdress and shoes. The dragon head is made of fosshape covered with spandex, with sheer fabric and millinery wire wings, airbrushed. The shoes are built on top of standard split-sole jazz dance shoes. Dragon body with silicone/spandex scale texture treatment and airbrushing. Recreation of a vintage fur stole with faux fur. I supervised a team of 3 milliners building approximately 150 hats (mostly turbans) for this production. The tailor bird's hat has "feathers" made of sheer fabrics layered and fringed with a wire and plastic filament spine. Hand painted and ombre dyed dress for Hedda. Pinecone hat made of fosshape. A baldric made to look like the corner of a mattress. A turtle's backpack and neck scarf. The backpack is made of hand-dyed cotton canvas. A snail's backpack, with space for a hidden bowler hat inside. 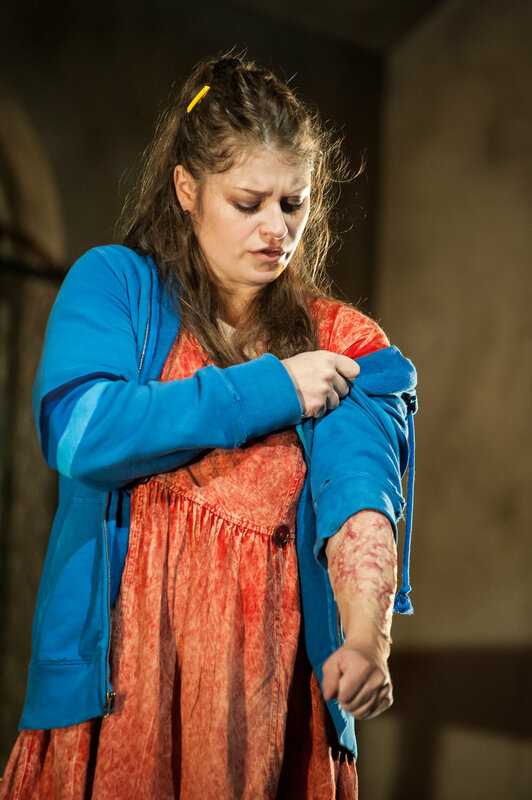 Distressing treatment on all garments in the show. The narrator's found object collage neckpiece. Fake pregnancy belly made of latex foam, spandex, and plastic. 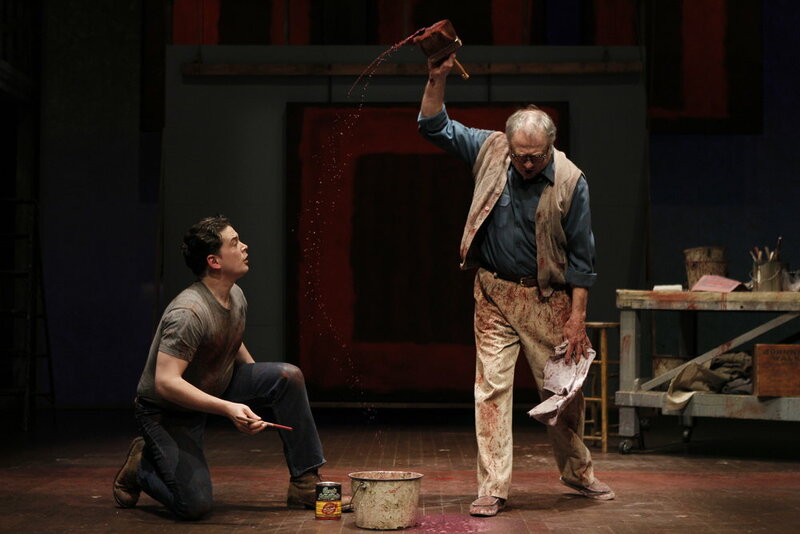 Rothko and Ken's paint distressed clothes.